Organizational Cognition is a collection of chapters written by scholars from around the world. The editors outline the history of two approaches to the study of cognition in organizations, the computational approach and the interpretive approach. The chapters represent some of the most cutting-edge research on organizational cognition, covering research that spans many levels of analysis. 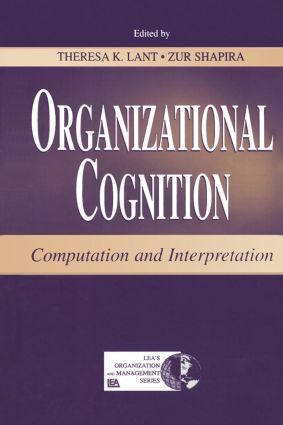 Much of the work in the book demonstrates how computational and interpretive approaches can be combined in a way that provides greater insight into cognitive processes in and among organizations. The editors conclude by elaborating the likely boundary conditions of each approach and how they can be combined for a more complete understanding of cognition in organizations. "…this book provides a fascinating story of the emergence of theoretical constructs, metaphors, and paradigms in a topical area of organizational research….If the purpose of this book is to be provocative and motivational to scholars in this area, I think it succeeds. Research directions and issues are identified; numerous conceptualizations meriting tests are proposed. The importance of the study of cognition in organizations is firmly established, and…the challenge is laid out and will hopefully inspire interested parties." Contents: A.P. Brief, J.P. Walsh, Series Editors' Foreword. Preface. T.K. Lant, Z. Shapira, Introduction: Foundations of Research on Cognition in Organizations. Part I:Theoretical Foundations. V. Dhar, The Role of Machine Learning in Organizational Learning. W. Ocasio, How Do Organizations Think? J.G. March, The Pursuit of Intelligence in Organizations. S.B. Sitkin, Commentary: The Theoretical Foundations of Organizational Cognition. Part II:Knowledge and Learning in Organizational Settings. D. Rulke, S. Zaheer, Shared and Unshared Transactive Knowledge in Complex Organizations: An Exploratory Study. C. Paul-Chowdhury, Internal Dissemination of Learning From Loan Loss Crises. P.R. Murphy, S.J. Mezias, Y.R. Chen, Adapting Aspirations to Feedback: The Role of Success and Failure. K.M. Sutcliffe, Commentary: Motivational Preconditions and Intraorganizational Barriers to Learning in Organizational Settings. Part III:Cognition at Work: Managerial Thinking and Decision Making. M. Tamuz, Defining Away Dangers: A Study in the Influences of Managerial Cognition on Information Systems. R.H. Bennett, III, W.P. Anthony, Understanding the Role of Intuition--Tacit Knowledge and Analysis--Explicit Knowledge in Bank Board Deliberations. K.U. Nair, Cognitive Maps of Managers and Complex Problem Solving. B. Vidaillet, Cognitive Processes and Decision Making in a Crisis Situation: A Case Study. J.M. Dukerich, Commentary: More Is Not Always Better: Limits to Managerial Thinking and Decision Making. Part IV:Social and Strategic Aspects of Cognition. V. Odorici, A. Lomi, Classifying Competition: An Empirical Study of the Cognitive Social Structure of Strategic Groups. A. Oldfield, Stakeholder Analysis as Decision Support for Project Risk Management. L. Brooks, C. Kimble, P. Hildreth, Understanding Managerial Cognition: A Structurational Approach. D.A. Gioia, Commentary: Strategy Is Social Cognition. Part V:The Past and Future of Organizational Cognition Research. W.H. Starbuck, Is Janus the God of Understanding? T.K. Lant, Z. Shapira, New Research Directions on Organizational Cognition.